While the old adage with a boat is that "it is a hole in the water that you throw money into," the recreational benefits of owning a boat still may move you towards purchasing your own watercraft. After you negotiate the best price on your purchase, consider your financing carefully. You have different options available, depending on if you are making a new boat purchase, or buying a used boat from a private seller. The boat dealer can assist you in obtaining financing on your new purchase. 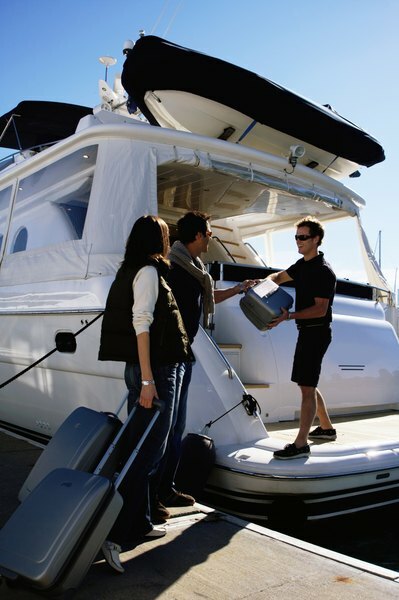 In many cases, it is the easiest way to complete your purchase and take the boat home the same day. A business or finance manager will take an application from you, and then try to sell a loan contract with you to a lender. The financing offers your receive will depend on your credit history, the price of the boat and the amount of down payment that you make. You can accept the loan that the dealer offers you to complete the sale, and try to obtain your own financing with better terms later on to refinance to boat. The dealership may also have access to manufacturer financing programs offering special incentives, such as no interest or payments for a specified time period. This option is particularly prevalent with personal watercraft or boats built by a major manufacturer. These loans often work like a credit card, and some do not even claim a security interest in the boat that you are financing. Qualifying with dings to your credit for these programs may also be easier than other loans, but you will pay for the privilege of easy financing with higher interest rates. You can look for boat loans through local banks or credit unions. Often, you will get your best financing deal with these sources, and with a private sale of a used boat, it will be your main source of financing. Start with the institution where you have your regular checking account. It may have special incentives for its own customers, such as interest rate reductions. Get a provisional approval for the loan if the bank offers it. When you make a purchase, the bank will need the details of the purchase to complete the deal -- generally a purchase and sale agreement that includes the serial number of the boat and the details of any cash down payment or trade. With a private sale, you will need this information from the seller. An informal bill of sale is sufficient. If you have a home equity line of credit, buying your boat is as simple as writing a check on that account. Your interest on the loan may also be tax-deductible. However, if you cannot make the payments, you will put your home at risk of foreclosure, instead of just loosing the boat to repossession with other types of loans. Many companies offer loans against 401(k) accounts held inside of their plans for any reason that you want, including the purchase of a new boat. You do not have to qualify based on credit, and the interest rate is low. In addition, you pay the interest rate to yourself. One problem with a 401(k) loan, is that if you leave employment, the loan is due within a very short time. If you cannot repay the loan, the IRS considers it a withdrawal. You will owe taxes on the amount at your normal income tax rate, as well as any applicable penalties for early withdrawals. Plus, you miss out on potentially higher returns that your money would otherwise be earning. With a bank or finance company lien against your boat, you are required to have insurance on the boat against physical damage or loss. This insurance protects the lien holder against the loss of the collateral. You insurance policy will need to name the lender as the loss payee, meaning the lender gets a check for the proceeds in a loss up to the amount of its loan. If the boat needs to be repaired, the lien holder will work with you to ensure that the repairs are completed. Begin by checking with insurance agents or companies that you do business with, to see if you can receive a discount for multiple policies by adding your boat insurance. Bankrate.com: So, You Want to Buy an Expensive Sports Toy? Do I Need a Primary Residence to Use a Vacation Home as a Tax Write-off? How Does a Downpayment Work on a Loan?